Roger says in his review "The Gene Roddenberry years, when stories might play with questions of science, ideals or philosophy, have been replaced by stories reduced to loud and colorful action. Like so many franchises, it’s more concerned with repeating a successful formula than going boldly where no “Star Trek” has gone before." He goes on to say "I understand that the character types are as familiar as your favorite slippers. But the franchise has become much of a muchness. The new movie essentially intends to reboot the franchise with younger characters and carry on as before. The movie deals with narrative housekeeping. Perhaps the next one will engage these characters in a more challenging and devious story, one more about testing their personalities than re-establishing them. In the meantime, you want space opera, you got it." So I guess Roger was disappointed with the story. He wanted some of the freshness and inventiveness of the original shows on TV, but that wasn't what this movie was supposed to be. This movie filled in the early years and showed us how the characters we are so familiar with, came to be who they are. I think the writers knew they were treading on dangerous ground, inventing a past for such beloved characters, and so I think they treaded lightly. And I think, in this case, that was very appropriate. Colin Covert said "This is really the story of how the Enterprise crew meets, hammers out its differences and becomes a team, and the telling is pure bliss." Joe Morgenstern says "Star Trek goes back to the legend's roots with a boldness that brings a fatigued franchise back to life." Dana Stevens says "Abrams' cannily constructed prequel respects (for the most part) the rules of that world and, more importantly, retains the original Star Trek's spirit of optimism, curiosity, and humor." And Tom Long adds "A film that should appeal to longtime Trekkies, sci-fi neophytes and pretty much anybody who likes a good action flick." On IMDB this really good movie has a 8.1 rating and on Rotten Tomatoes it comes in with a 94% rating from the critics. Popularity does not equal quality. Star Trek has lost its soul under the direction of JJ Abrams, and this review in itself proves you never really understood it to begin with. This deserved a nil, Ebert was generous. What's wrong with judging this entry as a fresh reboot of the series and a standalone movie? This one of the few reviews of his I agree with. The film was intelligence-insulting piffle. I agree with the above commenters. 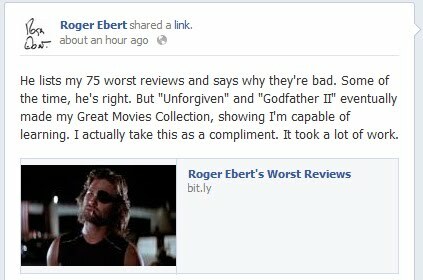 Yeah, Ebert disagrees with the majority of reviewers, but I think he nailed this one. As to the "fresh reboot" idea... normally one would do that. But Ebert's right on the money with "narrative housekeeping." The movie devotes so much of its plot to explaining why things are different than the original now; it even has Leonard Nimoy playing normal-timeline Spock. It's begging to be compared to - if not judged by - its predecessors. Sure, as a sci-fi space opera action flick it succeeds. But it isn't really Star Trek. LeVar Burton has the best take on this, I think - Abrams' Star Trek universe is really lacking Roddenberry's touch. There's no hope in it. It's "dark," "edgy," and the conflicts in it are unilaterally resolved at the business end of a phaser, not through negotiation, compromise, and attempts to understand different people and cultures. The movie dresses in the uniform, but it lacks the heart. Underneath, it's a comic book movie, not Star Trek. Sorry, this movie was god awful, a silly, contrived insult to every Star Trek sensibility. This movie was entertaining, but not the kind of movie I would give 4 stars. 2 or 2.5 at most. Dude, 4-star rating are not to be given out like candy!!! Ebert was guilty of this at times too, but 'Star Trek' 09 is absolutely undeserving and has already aged quite poorly.